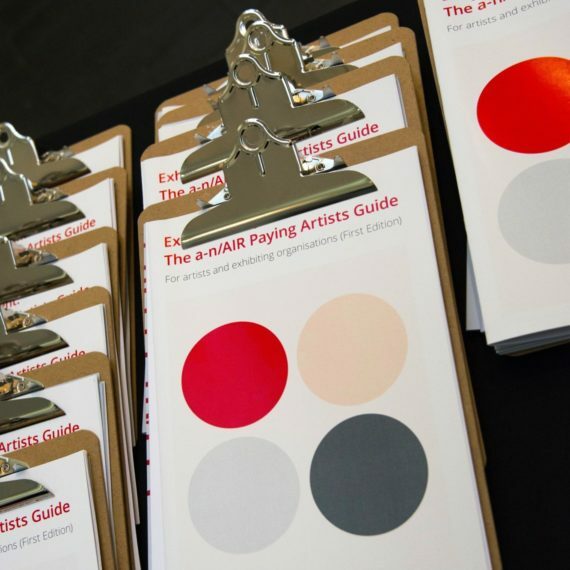 Following more than two years working and consulting with artists, major public funders and visual arts organisations, a-n and AIR has published new guidelines for paying artists for their contribution to public exhibitions. 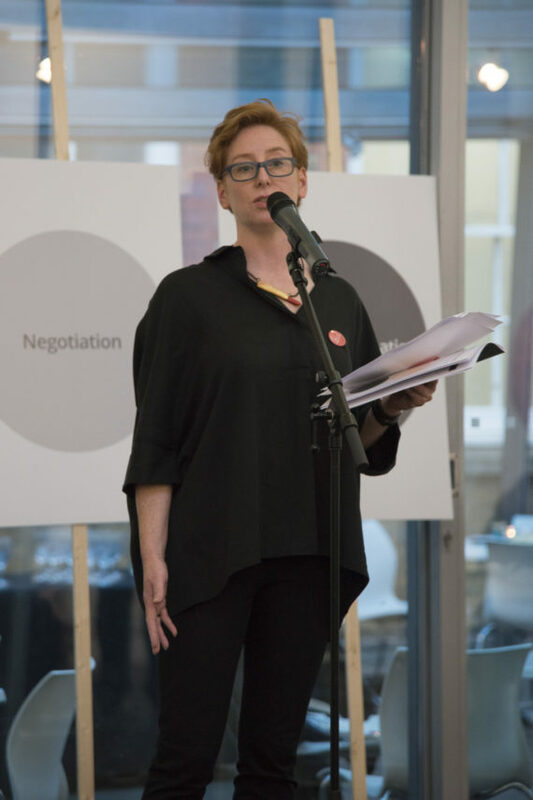 At the official launch yesterday evening at Jerwood Space in London, Shonagh Manson, director of Jerwood Charitable Foundation and Jerwood Visual Arts, outlined why she supports the principles of Exhibition Payment. 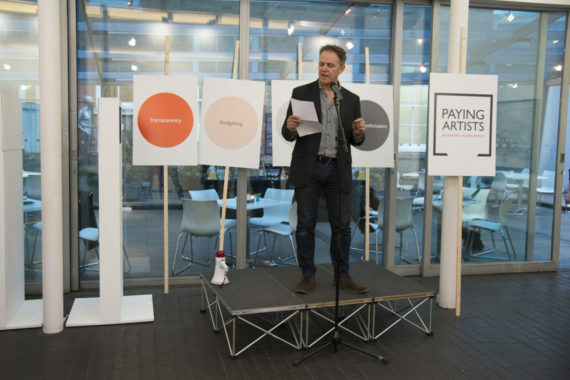 The guide outlines a set of suggested payments to artists (ranging from £150 to £6,000) as a fee for their contributions to publicly-funded exhibitions. It covers a wide range of exhibition scenarios along with guidance for implementation. The guidance is supported by Arts Council England, Arts Council of Wales and Creative Scotland. Speakers at the launch, attended by artists and representatives of UK visual arts organisations, also included the artist Jane Wilson, AIR Council member and artist Joseph Young, and a-n’s executive director Jeanie Scott. Scott highlighted the four core principles behind Exhibition Payment: transparency, budgeting, negotiation, and written confirmation. She added that consultations with almost 2,000 individuals and analysis of 166 publicly-funded arts organisations in Scotland, Wales and England had resulted in “a flexible, clear guide and payment framework that will help artists and organisations to agree mutually beneficial payments and agreements”. 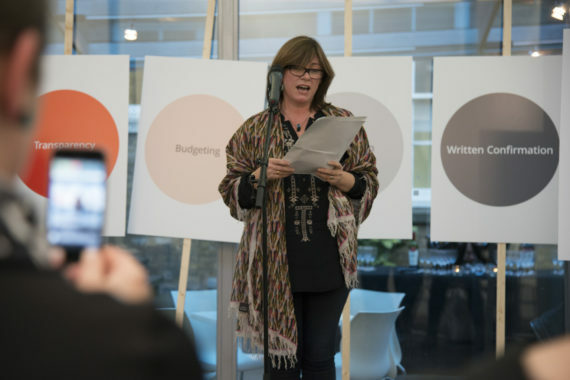 The launch of the guide, she said, marks the start of a change in how artists are considered and paid in the sector. “I believe this guidance is going to bring a lot of positive change in the years ahead, and I know this because I can see that we’ve come a long way already. Jane Wilson talked about the importance of public funding for artists. She said that as part of a collaborative artist duo with her sister Louise Wilson working in London since 1991, she’d seen the landscape for contemporary art change considerably. “With the rapid extension of the commercial art world, we’ve also seen public funding slowly decreasing, along with a decrease in the number of paid opportunities for artists. “So at a time of often unregulated growth in the commercial art market it is quite sobering to learn that the average artist earns £10,000 a year. A member of a-n’s advisory AIR Council when it initiated discussions about artists’ livelihoods in 2012, Joseph Young said that a key message from the early consultations with artists was that of diversity. If only those artists who can afford to work for free are exhibiting in publicly-funded galleries, then how are artists from less privileged backgrounds ever going to make a living? “All publicly-funded arts organisations have to have a diversity policy as a condition of their funding, so if we could ensure that a key outcome of Paying Artists was a greater diversity in the artistic workforce then galleries would benefit when artists are fairly paid,” he explained. 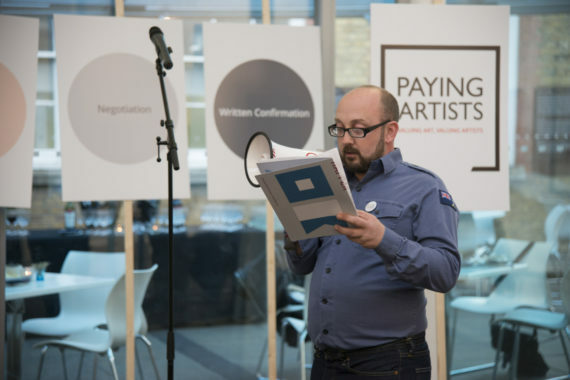 The evening opened with a short performance by artist and a-n board member Dan Thompson who read from the Paying Artists Artist-led Manifesto. Created by Thompson especially for the campaign, the manifesto sets out the principles of fair payment for artist-led groups and collectives. 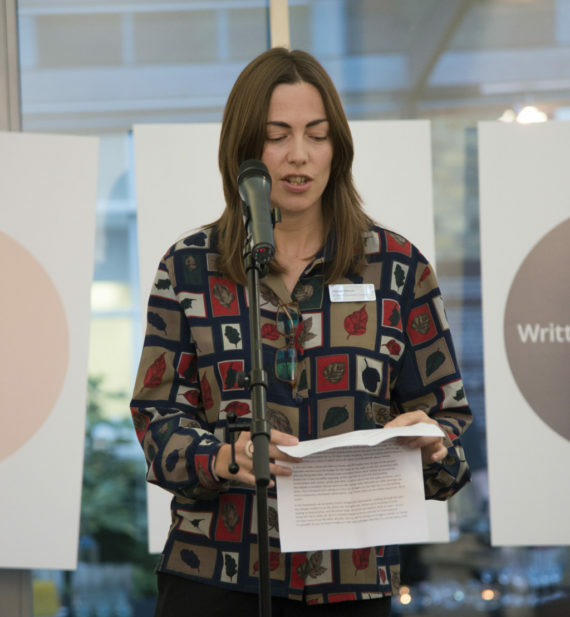 Thompson’s performance was accompanied by a series of events across the UK, with simultaneous readings taking place in Glasgow, Margate, Leeds, Stoke and Swansea. In her closing remarks, Jayne Knight expressed her pride in how a-n and AIR had worked with the visual arts sector to develop Exhibition Payment. “Together we have succeeded in creating something which will play a critical role in the future success of the visual arts sector,” she said. For more images from the launch event see a-n’s Instagram @anartistsinfo and visit our Facebook page to watch Dan Thompson’s performance.